Sixteen weeks of training I ran sincerely, no run was too long or too short. No racing in between. Hordes of events, I passed them all up. I was choosy and picky. Pace, choose the most comfortable. Clothes, pick the shortest shorts and go with a singlet. I went through the season injury free, which was a first. I was lunging and squatting more regularly but then as we were peaking off with a thirty four kilometer run, my glutes and hamstrings caught fire by the twenty ninth kilometer, it starts slow and then every little fiber is burning up forcing you to stop and once you start moving again, it just burns much fiercer. “The burn” they call it. Got to do with lactic acid build up. What it does remind me of is the time I went trekking in Shaklespur, lost my way, cut across an uncharted trail and got bit by a fire ant. Never imagined a single ant bite to cause such misery, they say the bullet ant is more potent, I have no plans of cutting paths with this monster. I’d prefer a lactic burn any day. Burning hams and glutes, the flames burnt away the haze I had built around me. I was still vulnerable to this distance and the veil had dropped. Then the mock run. It was my seventh time on this trail including the mock runs for the past four years and though there was nothing new about the trail, other than getting a little rockier this year, there is a sense of suspense to the trail. The suspense of the weather Gods. It drizzled hard on the mock day. I did decently on the mock run. Pull in comfortably and feel strong at the finish. I then overhear Kaiwan and Srini P, KTM veterans, discuss their race strategy, strangely it sounds like mine. I panic, there is no way I should be doing pace splits like these gentlemen. They turn to me and ask my strategy, I can’t tell them, “it was the same as yours till now”, I just tell them “Add an additional fifteen minutes to your five kilometers”. After the mock run, we assemble for lunch. Me, Siva, Paroma and Bipra take swigs of small mouthfuls of Glenlivet from Siva’s hip flask. Sacrificial altars normally don’t have too many teetotalers around. Even as we dangle our feet in the Cauvery in disdain, the fear has returned, lurking behind a rock on the trail, it piggy backed home. The Kaveri trail, is a brown rickety ribbon of a trail running along the embankment of an irrigation canal, twisting around green ​checkered paddy fields with bemused farmers ploughing and laughing at us​.​ ​Cows, oxen and the occasional bullock cart eating up the entire trail. The neighborhood of the trail​ is plush with migratory birds and the occasional crocodile who looks happy with his beady eyes, the feathers that adorn his ancient grey mouth are not his for sure; Storks, painted storks, kingfishers, herons, kites, peacocks and more birds that call the Raganthittu bird sanctuary ​their home,​ dot the sky. It’s a place to soak in at leisure, take swigs from hip flasks, try your ​hand at fishing, build a small spit, skewer and roast the days catch over it, but then, someone decided to run on this trail. All those footfalls seems to have pissed mother-nature especially on race days, and she spits down heat venomously, some years it’s tolerable and other years the heat is a massacre; year 2014 was a massacre. 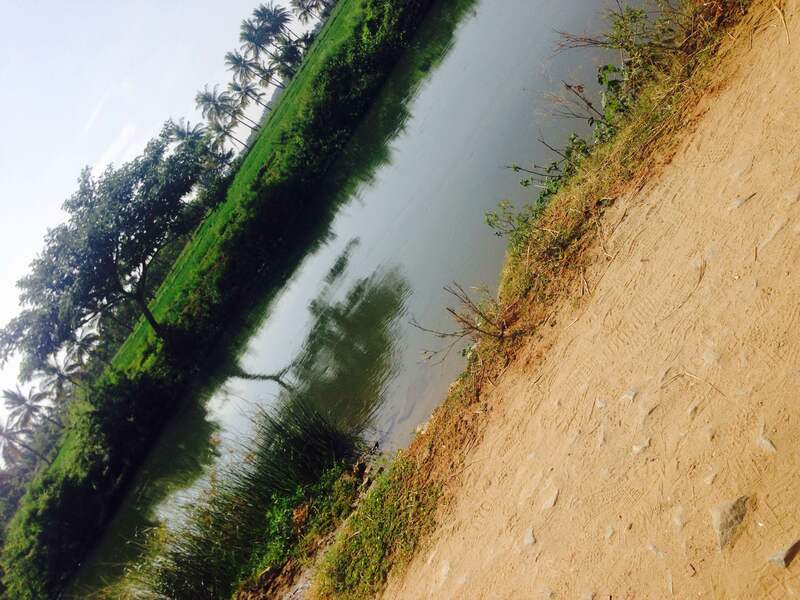 The heat is different on the trail due to the close proximity to a water body. Category one: Overcast skies or cloudy skies, the heat stirs the waters and the vapor adds to the humidity. With humidity you are still sweating but the sweat sticks to your body instead of evaporating, that means the whole cycle of sweating and cooling down doesn’t happen, the sweat sticks on you and you just go through an endless cycle of heating up. Dunking water on your self is the only solace. Category two: Clear blue skies, early sunrise and a wicked sun. The heat singes your skin. You sweat like a pig, the humidity is low, slight cooling with the evaporation of the sweat from the surface of your skin but it’s too little compared to the heat beating you down. Dunking your head under ice cold water is the only solace gain, whatever little respite you get. Race day arrives and fear has gripped me in its vice. I don’t sleep the whole night before the race, the prescription reads, eight hours of sleep, I toss around, try to read myself to sleep, watch television at two in the morning. No!​ The voices are a little too loud in my head. Images of Marshall’s nail-less toes flash across, little ten piglets, pink, bald and wrinkled. Not a good book to read before a big day. I fall asleep at some point in all that tossing, wake up and get ready for the race like a drill. Bath, nip-guards, Vaseline, nutrition. Race day. Extra nutrition. Chomp down on that apple in the car zipping through Mysore, chomp that banana as we park. The fear has emptied out and the empty space is replaced by the buzz of the race. I spot Chandra walking down with JLBR, a full marathon is routine for them. Photo time at start line, cat calls, war cries, chest bumps, and high fives and boom it’s six and off we go. I’m fired. I’m gonna tame you beast. I latch on the Garmin as we cross the timing mat, I turn towards the sky, only to thank the Lord for giving me a chance to savor this experience, my prayers stop half through as I stare towards the endless expanse of blue. Not a shred of a cloud. Not a rag insight, just a dark reminiscing blue. Six forty, forty minutes into the race and the sun rises fast and bright, the drizzled mock run comes to mind, I savor the irony. Two hours and forty minutes into the race, I finish my first half of the race. KTM is a looped race. Ten and half kilometers out and back. That completes the half marathon; the full marathoners do the loop twice. I pull into the planned pit stop. Paroma is the pit crew. I take off my wet dripping shirt and chug down some ragi malt. 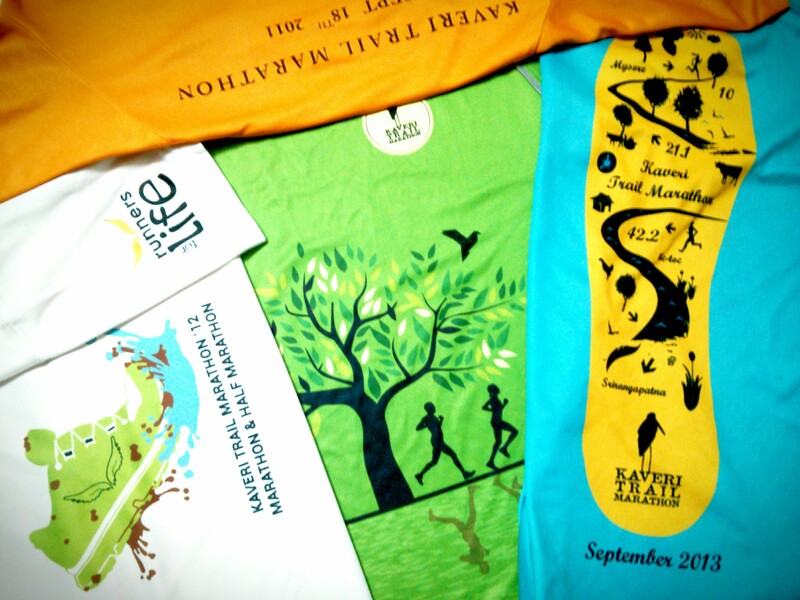 Chew a banana and Paroma hands me my fresh race singlet. Sleeveless and all. I am firing now. Fresh visor too. And more good news, fresh pair of legs, Sandhya is going to pace me for the next twenty one kilometers, this is unplanned and I love the idea. I move ahead in the superb company of Sandhya, turn the corner and the RH gang lords have occupied the zone. Anu offers me coffee, I’d love to, but I can’t. I gobble some pongal that Subhashini gives, high five Asha and Sushmitha and move ahead. This race was going better than I hoped, Sandhya sets a decent pace, and I focus on her orange visor and run. Of course by this time the legs are heavy but it is doable. We hear honking from behind and am not surprised, Paroma triple riding on a Scooter with RFLs organizers. They pass us, idea is to catch up with Paroma from the twenty eight kilometer, and she is hitching a ride. I’m lapping every minute of this run and then out of nowhere, that empty feeling as the energy flows away, the wall. I know the food I’ve been eating will kick in, it does. I walk for a while and feel the energy return. Reach the aid station and dunk my head under a sponge of ice cold water, Sandhya rubs some ice cubes on my knees and shoulders, it feels good, real good. I grab an ice cube in each palm and put one in my mouth and start running again, Paroma joins us by the twenty sixth kilometer, the party just got prettier and beautiful. There are returning half marathoners and they give me bemused looks. Pampered runner with two lovely ladies for company. They’d like some company too I guess. It’s a lonely course; the demons in your head will hunt you down. It’s nice to go out for a hunt with the pretties than all alone right? Even though I had company and it kept my mind off the running, the heat was taking a toll on me. The sun was unbearable, I had already taken Sandhya’s sunglasses, I couldn’t open my eyes without squinting. I stuffed my mouth with two ice cubes and one each in my palm as I ran. They melted away within minutes in the heat. I was constantly thirsty and the run just became about surviving the heat. Past this point, say around the thirty kilometer marker, I remember the race in small flashes. The aid stations had run out of bananas, after paying a bomb for this race, there were no bananas to be given away. What do I do? Break the basic rule of not trying anything new on race day. I gobble a GU shot. Had tried it once and hated it, but loved the chocolate flavor. Guess at this point my body would just take in any form of food. I swallowed three more of these till the end and frankly it was what drove me to the finish, the GU shots and the girls. Unfortunately I cramped by 32k in my calf and after that the whole race was reduced to finishing. I walked a lot after that. Running whenever I felt strong. Running in the sun and then walking in whatever little shade the trees provided. We tried to have fun. 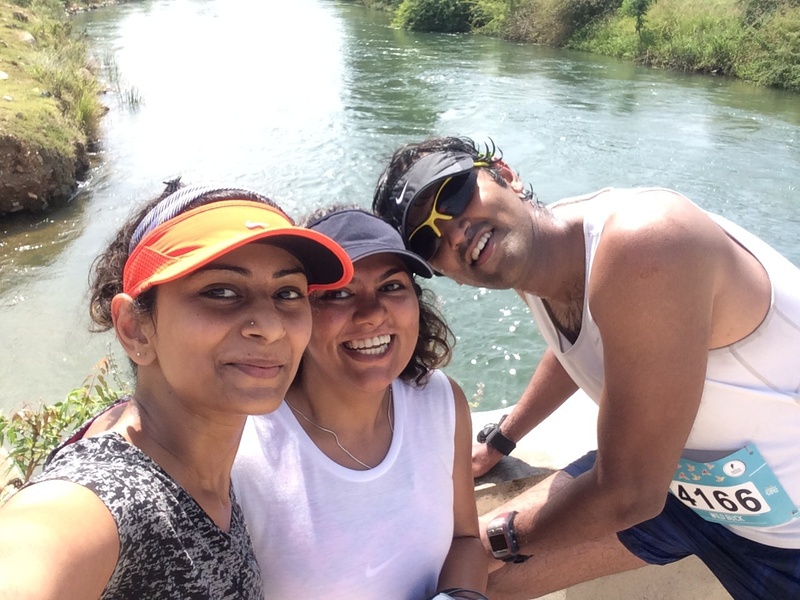 Paroma played Dire Straits on her Mobile, Sandhya sang, we shot selfies, picked one other runner along the way and dragged him along. With one more km to go, I was a spent force, I wanted to run but all I could manage was a brisk walk. With last two hundred meters to go, Sandhya asked when I’d start running, I mumbled “From the marker” but I was slurring alright. Guess it sounded like “Never” for Sandhya shot me a look and demanded I get moving right away. I managed to point out to the marker. Eating all that ice had the insides of my mouth swollen, tongue included. Slurring was all I could do. 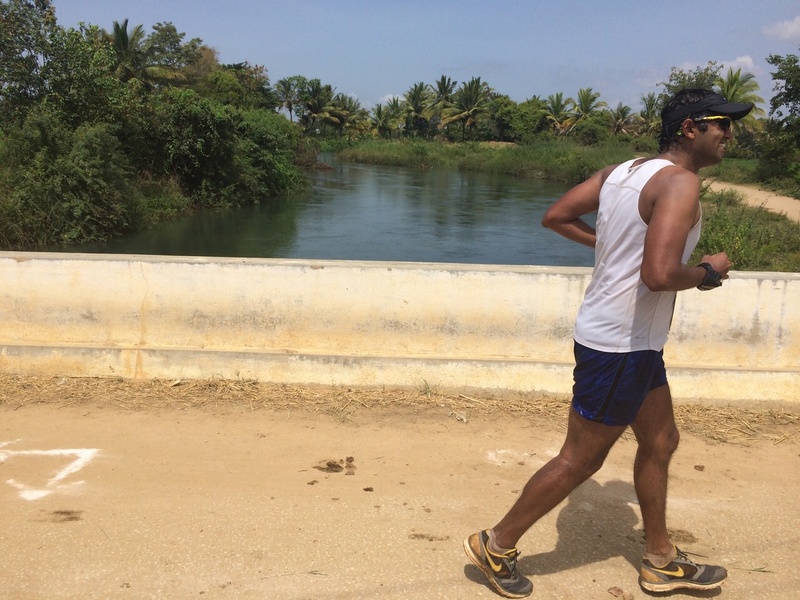 I managed to pick pace for a slow jog and was happy to see two of my buddies hundred meters before the finish, they had biked down from Bangalore to see me finish. Such a familiar sight. Paroma was near the finish, having helped the other runner cross over, the RH gang of Asha, Anu, Subhashini, Darius, Siva, Sharath, Aishwarya, Ashish, Sushmitha, Srini P, Imran, Radhika and many more lined the finish area, cheering, calling out to me to sprint, I didn’t sprint though, still afraid of cramping up, I jogged across the finish line and felt accomplished. I looked at the timer, I had shaved nearly thirty minutes from last years’ time, it hardly mattered, the idea and goal was for a strong finish, and that I had achieved. Bear hugged Paroma and Sandhya, and everyone out there, am sure some ran away, who wants a slimy and stinky hug. More pampering continued. Asha, handed me some water, Siva some Soy milk. What a race he had run himself. Proud of him. After a little camera time and posing, I entered the pool for the mandatory ritual dip. Right in the middle of the pool, Subhashini comes down and hands out a bowl of pongal. There are few things in the world that’ll ever match up that bliss. Sitting cross legged in flowing water, surrounded with people who you love, having run a tough forty two kilometers and eating pongal with your fingers. That’s a new level of bliss and awesomeness. There are so many memories woven into the race. Group hugs with Jayanti and Kavita, Kavita running her first half and Jay pacing her through. They pushed me forward with kind words and catcalls. Radhika and Imran, who ran an half marathon instead of a 10k because they liked the trail too much.There were new friends I made along this run. 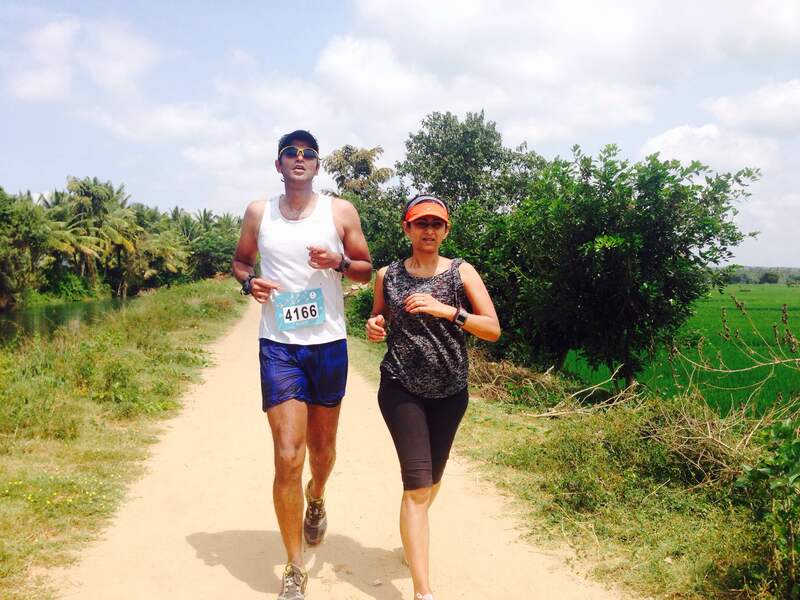 Dhana, Aprajita ran half marathons and did a fabulous job and moreover loved the course. Kaustav and Niran ran blistering half marathons and we have a common ground to discuss endless routines now and then which joint to raid for some yummy food. This race experience would be dishonest if I didn’t mention Paroma and Sandhya. I should probably write a separate report on the help, encouragement they’ve provided. Pampered like a baby. I have serious doubts if I could have finished this race without them. I won’t shy away from telling that the thoughts of quitting this race did occur at one point of time around twenty eight kilometers into the race. The heat was blistering, I had doubled over, hands on knees, eyeing the soft grass to roll on, the ice cold water being poured on my back kept those ideas at bay. When I wasn’t doubled over and was on the run, the run was unbearable, pain and exhaustion greased on self-doubt had long replaced fear. I was living what I had feared, the heat and the exhaustion; there was nothing else to fear. I felt timid and felt I had let down myself. There was no bravado left. To think of quitting is the first step and without Sandhya’s constant talking and singing I would have given in and let quitting take hold of my thoughts. 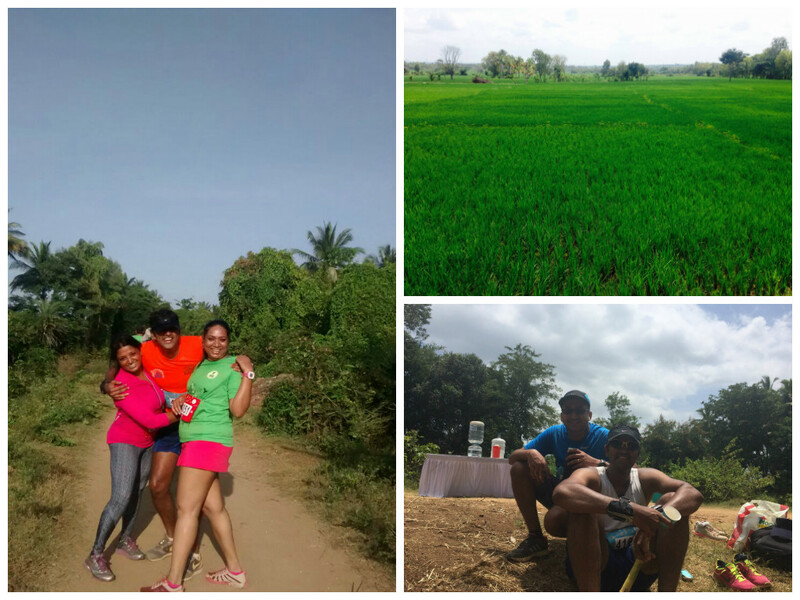 They’d point to the paddy fields even as I limped out of my cramps and say “see how green it is” “there’s beer at the end of this” “Will you run Mumbai” “You are a strong boy”. It kept me distracted and helped me focus on the run and why I had taken it on myself to finish it. It helped me dodge out the self-doubt with some hope of finishing. Without the help of these pretty ladies this race would have been long over. I’ll be forever indebted for that. I reflect back on the run and the place that is KTM. I’ll always run this course. As amazing and tough it is, there is an allure to the place that I find fascinating. There’s word in Kannada. It’s called Audaryaa. The first and last time I ever heard that word was in my tenth standard kannada lessons. It’s a short story by Kuvempu and the story is called Audaryaa. It translates very loosely in English to generosity, but then, you know how some words or phrases can never be translated without losing it’s true worth. Audaryaa is one such word. The reason I remember this word so vividly is not because of the story as such but the closing sentence of the story. It goes “Kadidhu oodi hoguvaa havinaa hedeyallu soundarya kaanalu audaryaa beku” “To see the beauty in a serpent’s head that has just bit you, you need audaryaa” The enormity of that emotion is tough to understand and though I remembered the word and sentence all these years, it made true sense only today. Probably for me, it’s just KTM and audaryaa. 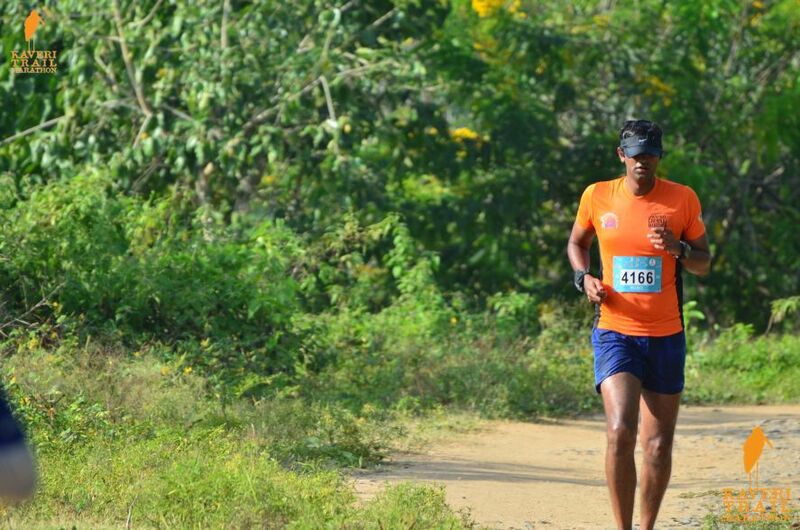 This entry was tagged 26 miles, 42.2, full marathon, kaveri trail marathon, KTM, Mumbai, Mysore, race story, Srirangapatna, walking. Bookmark the permalink. Very lovely article as always 🙂 really amazed that you get so many emotions into the race and if what all runs in your mind !! Wonderful writing. Sums up my first marathon perfectly. Thanks Judith, first marathons are really close to the heart aren’t they? Wow beautiful write up and finally all the perseverance bear results of satisfaction .Proud of you. Great stuff man! KTM always tests your guts. Nice narrative . Reminds me of my First and Only KTM full marathon in 2011.